Ah, tree-ripened fruit. That exquisite experience of biting into a juicy, flavor-filled peach or pluot that falls off the tree into your hand on a warm summer morning. The experience is especially satisfying—and safe—when the fruit is harvested within reach of the ground or with a small stepladder. 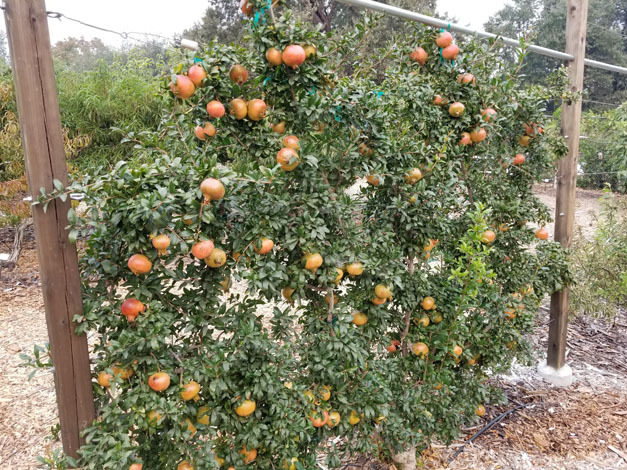 In the Fair Oaks Horticulture Center orchard, the primary focus has been on keeping fruit trees small, as the average backyard is getting smaller and smaller. The orchard began in 1998 as a demonstration of “fruit bushes,” which are standard or (preferably) semi-dwarf trees kept small mainly by summer pruning. The method was not new, and Ed Laivo, of Ed Able Solutions, popularized it. The strategy requires pruning in spring and summer to keep tree height down and allow sunlight into the lower canopy to promote flower buds low in the tree. Those buds grow on spurs and other specialized fruiting branches. The concept of cultivating fruit bushes for the home gardener was a huge paradigm shift. Because the traditional practice was to prune fruit trees in winter when branches were easier to see, summer pruning is unfamiliar to most gardeners. Winter pruning does afford the advantage of actually seeing what you’re cutting. But if you look closely during the growing season, shoots can be traced to their origin, and by mid-spring, it’s easy to see the nefarious intent of the most vigorous upright shoots. By waiting until winter to prune, each of those robust shoots has turned into a tree on top of a tree, and the combined result is what big trees do best – provide shade. But when do flower buds form? During the summer before bloom the following spring. And what do spurs and fruiting branches require to produce flower buds? Sunlight! Fruit bushes were a hit, even though they still require a fair amount of horizontal space. 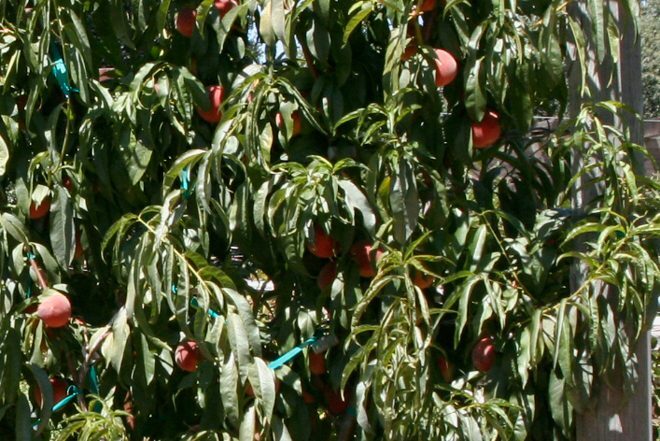 Crops can be harvested from the ground, and the problem of shade on lower fruiting wood, which causes fruit to move to the top of the tree, is less of an issue because the trees are kept small. When insect pests become problematic, growing fruit, especially insecticide-free fruit, can be very challenging. 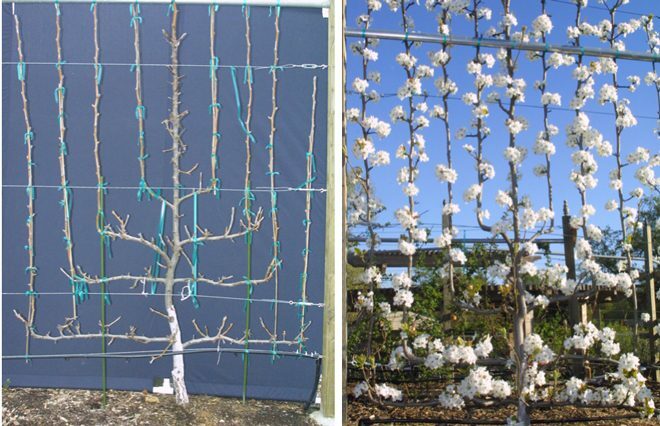 The age-old method of espalier training provides some relief and new ways of growing fruit trees. 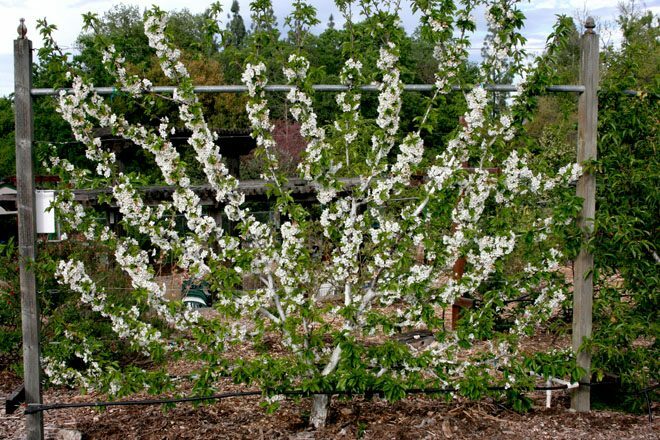 The practice has several advantages in the garden and is widely used in commercial apple and pear production in the Pacific Northwest and Europe. 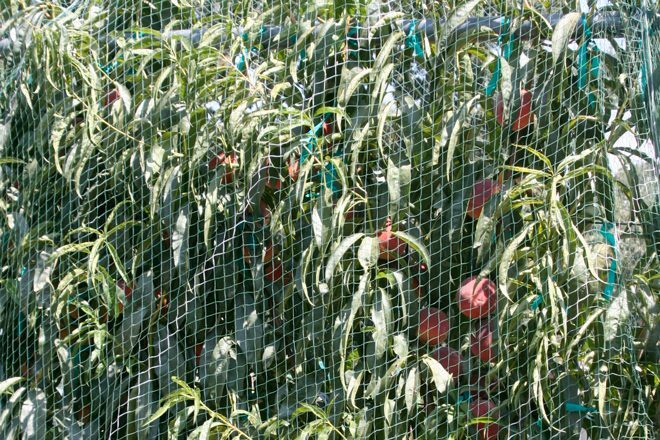 Fruit tree trellis structures can fit into narrow spaces on smaller lots, as long as there is sufficient sunlight—at least six to eight hours. Training trees into narrow, fruiting walls increases sunlight exposure for efficient production, it facilitates easy fruit thinning, pruning, and harvesting, and it improves spray coverage. 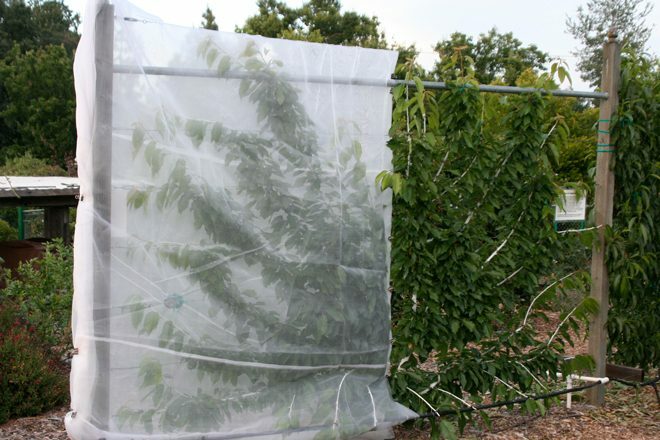 An additional key benefit of fruit bushes and espaliered trees is the ability to cover trees with bird netting to reduce damage by birds, squirrels, and deer, or with row cover material to reduce sunburn and insect pest damage. Also, covering trees with plastic or a somewhat porous material before rains after bud break can keep trees dry and may reduce the need for copper or other fungicide applications, although heavy winds can render covers useless. Finally, as with fruit bushes, espalier-trained trees tend to be smaller than those of other training methods and therefore use somewhat less water.